Heat the oil in a frying pan over a medium-high heat. Add the mustard seeds and curry leaves cook util they start to crackle. Remove from the heat and set half of the leaves aside for serving. 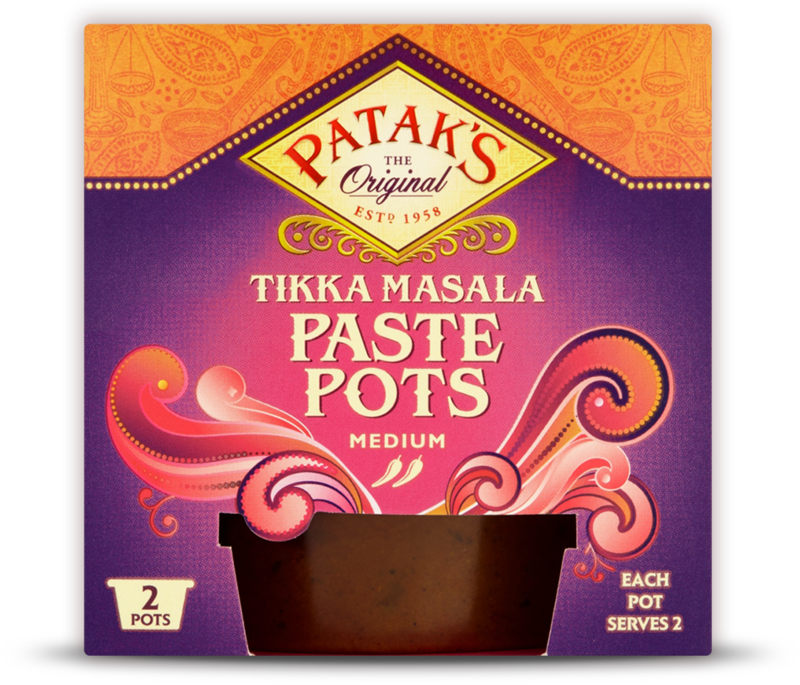 In a mixing bowl, combine the gram flour, ginger, Patak’s Tikka Masala paste pot, salt and crushed black pepper to taste. Add the remaining curry leaves and mustard seeds. Add enough water (180ml) to make a batter thicker than fish and chips batter. Toss the cauliflower in the batter. Heat enough oil for frying in a saucepan to 180°C and fry cauliflower florets one by one until golden brown and crispy. Remove to a plate lined with kitchen paper to drain. Serve garnished with curry leaves, mango chutney & mint coriander chutney. Another goodie for your slow cooker. This vegetarian recipe uses our two most popular Spice Pastes - Tikka Masala and Korma - to combine the delicate nuttiness of the Korma spices with the more tangy and spicy elements of a Tikka Masala. Totally delicious and chocka block full of the goodness of veg! I love this version of Chicken Tikka Masala, because the spinach adds a wonderful texture and colour to the dish. You also can't help but feel virtuous when you include a bit of spinach in your meal. I have added extra spices such as cumin seeds and garlic & ginger Spice Paste to sharpen up those flavours even more - and give the dish extra bite, but if you are short on time or ingredients, it is fine to simply use the Tikka Masala Spice Paste.